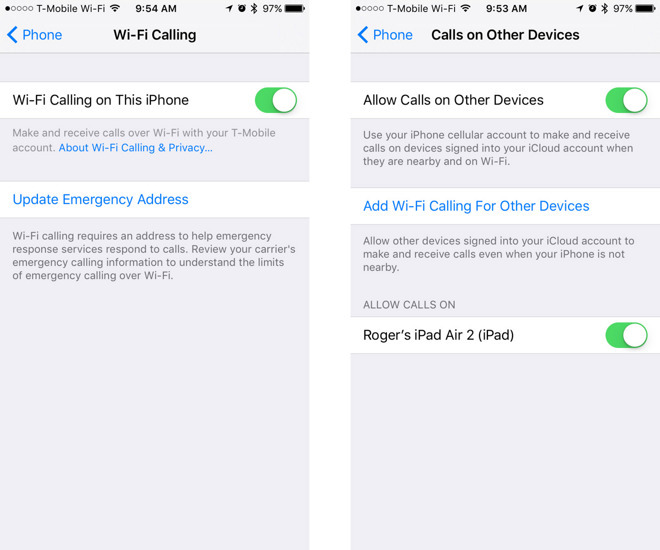 With Monday's release of iOS 9.3, all four major U.S. cellular carriers —including the latest addition, Verizon —now support Wi-Fi Calling on Apple devices. Here's how to activate the feature on supporting networks. Enabling Wi-Fi Calling offers another perk though, which is the ability to make or receive calls from other Apple devices linked to an iPhone's Apple ID —including Macs, iPads, iPods, and the Apple Watch. To do this, you need to go into the Phone menu's Calls on Other Devices section, and then tap Add Wi-Fi Calling For Other Devices.